Marina's Kitchen Table: Meeting in the Meadow: Where is God When Your Heart Aches? 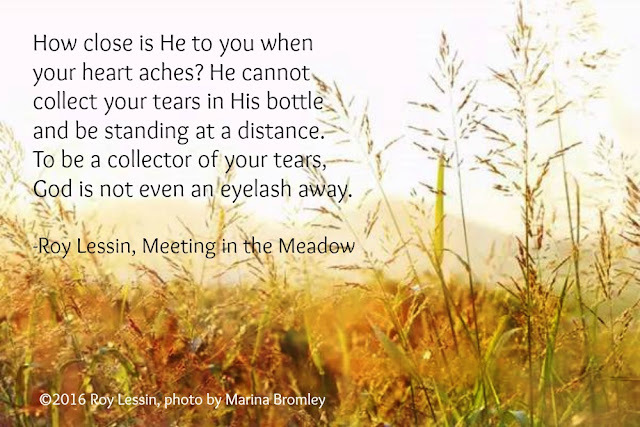 Meeting in the Meadow: Where is God When Your Heart Aches? Where is God When Your Heart Aches? The meaning of “Tabernacle” reaches into the deepest places of our hearts. Its impact was first known to the people of Israel in the book of Exodus (29:4), was revealed to the early church through the Gospels (John1:14), and is spoken of in the book of Revelation as an extension of God’s loving care to His people in the final days (Revelation 7:15 AMP.) The word “Tabernacle” brings to us one of the clearest revelations of the love and care of God for His people. It says to us that God has chosen to come to us in our need, to draw close in intimacy and compassion, and to cover us with His presence. When God’s people go through great hardships and heartaches we often wonder what can be said that will bring true comfort and hope? One of things I believe we can say with strong affirmation is that God is there, in the midst of it all, drawing closer than any friend or family member ever could. This is at the heart of Jesus, our Tabernacle. Jesus didn’t stay away from us, hiding from our sorrows in heaven; He came to us and tabernacled with us. In the book of Revelation, God reaches out to those who have come through great tribulation and spreads His tabernacle over them—the tabernacle of His presence to protect and shelter them. In the midst of our deepest sorrows, tears, and struggles God spreads the tent of His presence over us! How close is God to you when we face our greatest trials and difficulties? The Bible tells us that God collects our tears in His bottle, and that one day He will wipe away all tears from our eyes. How close is He to you when your heart aches? He cannot collect your tears in His bottle and be standing at a distance. To be a collector of your tears, God is not even an eyelash away.